A number of political factors affected Kennedy’s decision and the timing of it. In general, Kennedy felt great pressure to have the United States “catch up to and overtake” the Soviet Union in the “space race.” Four years after the Sputnik shock of 1957, the cosmonaut Yuri Gagarin had become the first human in space on April 12, 1961, greatly embarrassing the U.S. While Alan Shepard became the first American in space on May 5, he only flew on a short suborbital flight instead of orbiting the Earth, as Gagarin had done. In addition, the Bay of Pigs fiasco in mid-April put unquantifiable pressure on Kennedy. He wanted to announce a program that the U.S. had a strong chance at achieving before the Soviet Union. After consulting with Vice President Johnson, NASA Administrator James Webb, and other officials, he concluded that landing an American on the Moon would be a very challenging technological feat, but an area of space exploration in which the U.S. actually had a potential lead. Thus the cold war is the primary contextual lens through which many historians now view Kennedy’s speech. The decision involved much consideration before making it public, as well as enormous human efforts and expenditures to make what became Project Apollo a reality by 1969. Only the construction of the Panama Canal in modern peacetime and the Manhattan Project in war were comparable in scope. NASA’s overall human spaceflight efforts were guided by Kennedy’s speech; Projects Mercury (at least in its latter stages), Gemini, and Apollo were designed to execute Kennedy’s goal. 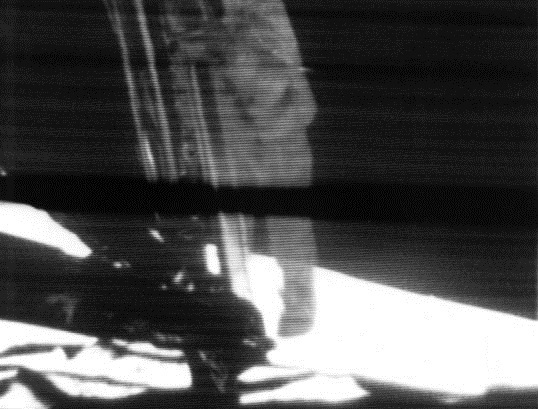 His goal was achieved on July 20, 1969, when Apollo 11 commander Neil Armstrong stepped off the Lunar Module’s ladder and onto the Moon’s surface. These are two documentaries, each an hour long, about aspects of the Apollo 11 Moon landing story that never get told. Apollo is always the story of the people at Mission Control and Neil Armstrong and the engineers that accomplished this incredible technological feat. Very few people then look at what happened in Washington, DC. We very nearly didn’t go for political reasons inside the Beltway. The political problems of maintaining a coalition of support to fund the program were just a difficult as were the technical problems that the engineers in the field were facing. You can read the text or listen to the hour long audio of the Apollo 11 Space Mission Moon landing story that never got told at the above link. Hillary’s initial career choice was a dream. She remarked at one time in high school, her ambition was to be an astronaut. Well, we know how that turned out..
Secretary Clinton, the country is forever beholden to you for not choosing to be an astronaut.. I think Kennedy had promised that the U.S. would put a man on the moon in that decade. So there was time race aspect as well. I think the building of the Hoover Dam might qualify as a technological marvel as well. Yes, there is a fascinating documentary out there of the building of the Hoover Dam. The workmen building the forms for pouring the concrete dangling in the air at such extreme angles suspended only by ropes made of hemp (no safety nets, no helmets) hundreds of feet above the Colorado River. Could not do that today- OSHA would have plenty to say about workers safety issues. How scared is Obama sending out an e-mail with these words attached? Begging for $5 donations? All it tells me is his Plan B is in play and he is making ready to use it.! Obama’s campaign manager Jim Messina sent an email Saturday that makes the Obama campaign seem like it is clinging to its last days in power. President Barack Obama’s campaign has been outraised by Mitt Romney’s campaign and the Republican National Committee; Romney and Republicans have roughly a $60 million cash-on-hand advantage over Obama and Democrats. Polls in crucial swing states like Virginia and Midwestern states like Wisconsin that were once a part of Obama’s electoral baseline have been trending in Romney’s favor. The new movie “2016”- is building steam around the nation in spite of it’s limited showings in theaters around the country.. The reviews vary from total shock to reconciled confirmation felt by Obama supporters duped into voting for him. Gerald R. Molen, the Oscar-winning producer behind “Schindler’s List” and “2016,” and Dinesh D’Souza, upon who’s book the film is based, should send the corrupt media a fruit basket today. Nothing we’ve seen over the last four years and especially during this campaign in any way matches the carefully crafted image Obama and his media punks have crafted and bitterly clung to. The quietly competent and charming no-drama Obama the media assures us is the real Obama is in reality a feckless, ugly, dishonest, divisive punisher of success willing to accuse his opponent of felonies in order to hold on to power. In response, the media just pushes more propaganda. HOW IN THE WORLD CAN MSM CONTINUE SAYING THE ELECTION WILL BE CLOSE? The crowd in these pictures taken in Ohio yesterday morning belie the current polling appraisals done by the polling propagandists. It is apparent Romney hasn’t paid people to attend- nor have the attendees been handpicked in a staged effort showing support. Another example of the LYING media: MSNBC headline (without any pictures): “The crowd that turned out Saturday morning to hear Mitt Romney and Paul Ryan speak at the Village Green Park Amphitheatre in Powell, Ohio was estimated to be about 100 people”. For those interested, here’s the revised speaker schedule for the RNC convention. Monday speakers will be rescheduled over the rest of the week because of cancellation due to Issac. Also, Scott Walker has been added to the speaker roster. A presidential election prediction model developed by two University of Colorado professors points to a Big WIN for GOP presidential contender Mitt Romney in November. The model, the only of its kind to use more than one state-level economic indicator, has correctly predicted the winner of every presidential election since 1980. It predicts Romney winning the electoral college by a 320-218 margin and winning 52.9 percent of the popular vote when only the two major parties’ candidates are considered, the Associated Press reported Thursday. Fox TV did an interview today with Romney and his family. Actually quite nice. There’s still the Soros vote-rigging software to contend with, but may it be so. Between Romney and Ryan… Ryan said he has 55 cousins. They would constitute quite a mob of voters.. Romney is the epitome of the Cleaver family 50 yrs hence. Based on the internal U.S. Immigration and Customs Enforcement (ICE) documents, the number of removals are actually down, the opposite of what the administration has been claiming. The committee chair claims that counting those individuals as removals is misleading because there are no repercussions for illegal immigrants who are deported through the program, and they can simply try to re-enter. Given the new information, the committee’s Republican majority subtracted the ATEP removals from ICE’s deportation totals. The new estimates mean that this year the Obama administration’s deportation record is 14 percent below 2008 (which was 369,000) and 19 percent below 2009 (which was 389,000). The chairman blasted the administration after the discovery, charging the president and administration officials with falsifying their record to meet political ends. Smith has been critical of the administration’s immigration record, most recently with Obama’s deferred deportation plan announced in June. Thank you, foxy for posting the full interview. The Romneys are comfortable in their own skin which is in such contrast to the current aloof, stilted, chip on their shoulder squatters who feel they are above it all with a ‘do as I say, not as I do attitude’. The stark comparison between what we have now for a US president and what we CAN HAVE for a US president if we overwhelmingly vote for the Romney/Ryan ticket is a no brainer for Americans. Therefore, I believe Romney will carry the Nation in a landslide victory unseating the people who stole Hillary’s destiny and who never belonged in the White House in the first place. For anyone interested, Chelsea Clinton did an exclusive interview for Vogue this month…. The Romney Family in 2007 with their children and grandchildren. Fun fact: Tagg, who served as a senior advisor in Romney’s 2008 campaign, has been just as active this time around. He tweets (@tromney), linking to everything from campaign coverage to the latest SNL skit about his dad. His oldest child, Allie—who is also the oldest of Mitt’s and Ann’s 16 grandchildren—is currently being home-schooled just so that she can hit the campaign trail for her granddad. Fun fact: In a family of pranksters, Matt stands out. In 2008, he prank-called his father, pretending to be California’s then-Governor Arnold Schwarzenegger. You can watch the call play out on YouTube. Fun fact: Ben calls himself the oddball of the family—he’s the only son who has remained blond (most of the boys were towheads when younger) and he’s the only one who has pursued a career in the sciences. Fun fact: Fluent in Spanish, Craig recorded several Romney ads for Hispanic audiences in the past. She looks stunning..those are her colors.. the colors of summer… blue sky, beach sand and ocean blue.